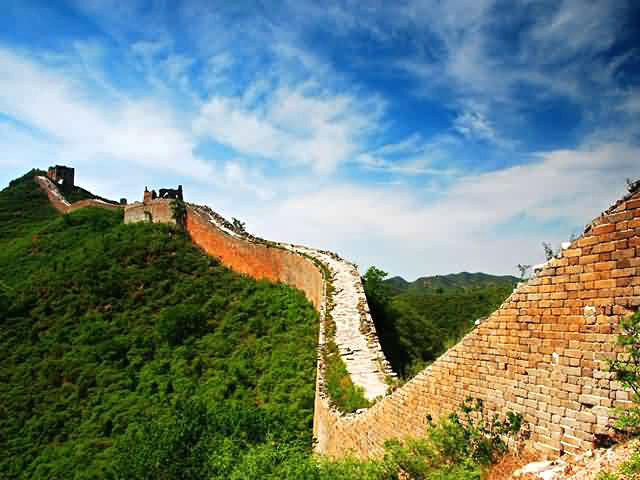 Simatai Great Wall is located in northeast of Miyun County which is 120 kms (74.52 miles) from Beijing city, lying on Yan Mountain, neighbouring with JinShanling Great Wall. 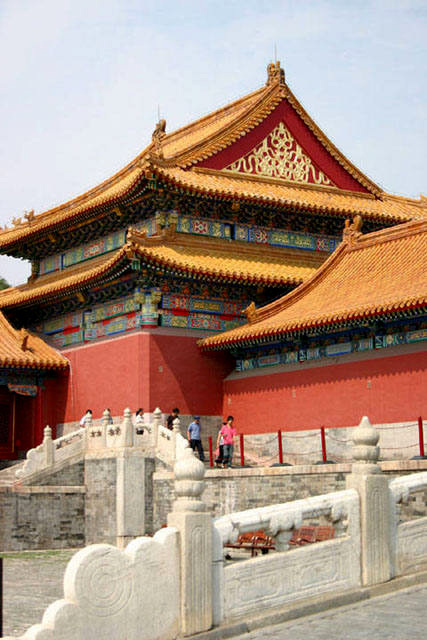 It was originally built in the early year of Hongwu reign (1368-1398) of Ming Dynasty, later repaired in 1573 by Qi jiguang- a famous patriotic general officer of Ming Court. Simatai Great Wall was listed into the special class of World Cultural Heritage by UNSECO in 1987, and opened to visitors in 1990. Primitiveness——Simatai Great Wall is the only Great Wall that preserved the complete ancient style of Ming Dynasty in China. And UNSECO defines it as the primitive Great Wall. 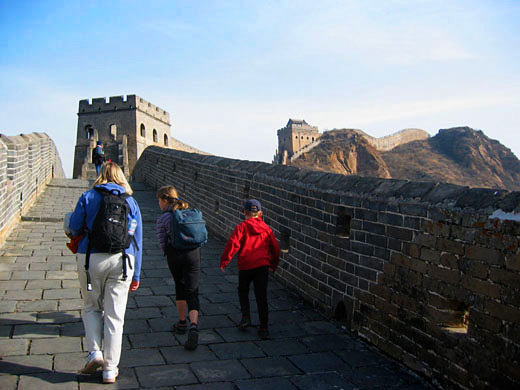 Challenging Experience——Simatai Great Wall lies on Yan Mountian, especially its east section lies across steep cliffs, it really needs plenty of nerve for a climb and excites you with a fabulous experience. Breath-taking Sceneries——it owns beautiful trees and grasses, clear sky and lake, old bricks and walls,etc. 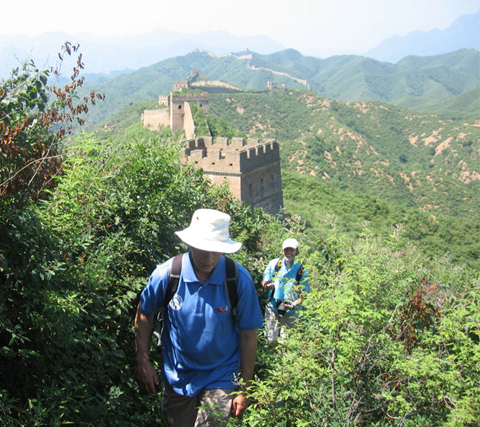 And one can overlook the whole views of Yan Mountain as well as the beijing city. 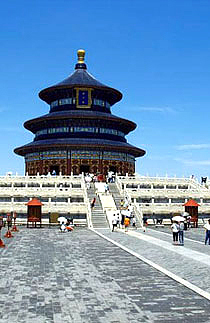 Various Structures of Towers——every tower was found to meet strategic needs with different sizes and structures. 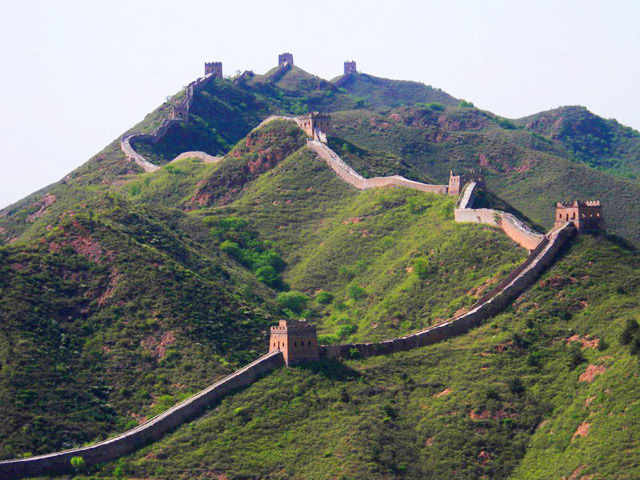 In the past, Simatai Great Wall has seen many wars between Chinese rulers and other warmongering nomadic tribes, and somehow it has become a symbol of spirit of perseverance and human intelligence. 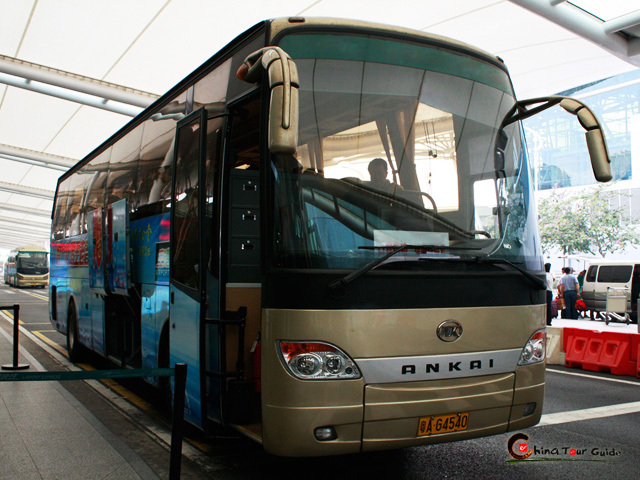 Nowadays, it attracts seas of visitors every year, including many great and famous people. 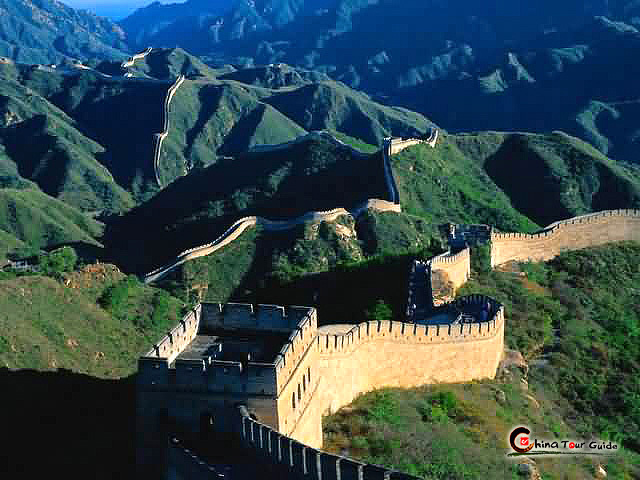 About this amazing Great Wall, Professor Mr.Luo Zhewen, a famous Chinese expert on the Great Wall, once remarked, "The Great Wall is the best heritage of China, while the Simatai Great Wall is the best of the best!" 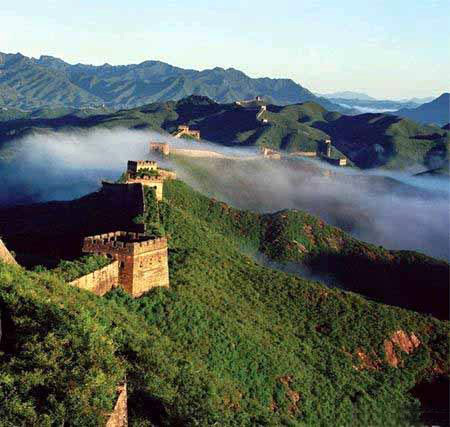 Simatai Great Wall is the only Great Wall that preserved the complete ancient style of Ming Dynasty in China. Wangjing Tower is the best shooting spot for photo lovers in summer and autumn. 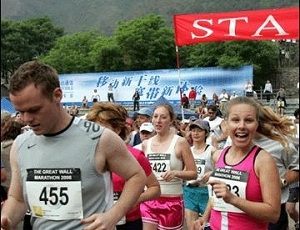 Generally, the startling Simatai Great Wall stretches about 5.4 kms (3.36 miles) from the east starting point-Wangjing Tower to the west with a total of 35 watch towers, and is divided into two sections by Yuan yang Lake(named after the romantic mandarin duck). 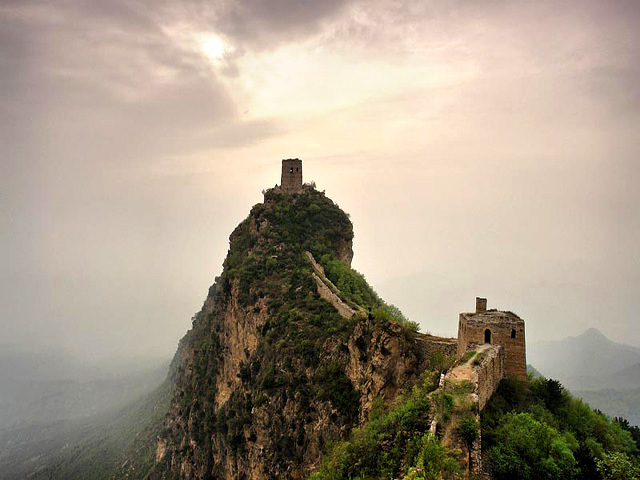 The west section appears a gentle surface of mountain, on which stands 18 watch towers; while the east section winds to fluctuate, like a natural track of the roller coaster, snaking along the cliffy mountain ridge with 16 watch towers on each mountain peak. Within the span of only 2.4 kms (1.49 miles), the altitude of the east section steeply rises from 295 meters (968 ft) to 986 meters (3235 ft).Thus, given by this unique topography, Simatai Great Wall is well-known for its danger. Besides, due to the special geographical condition, it is much more difficult to build it at the time of poor technology. And the whole construction and the design represent exemplary skills of creative workmen of ancient times. Another outstanding feature of Simatai Great Wall is the intensiveness and variety of towers, and every tower was found to meet strategic needs with different sizes and structures. Until now, people who has visited Simatai Great Wall can not help expressing their admiration for its construction and greatness. 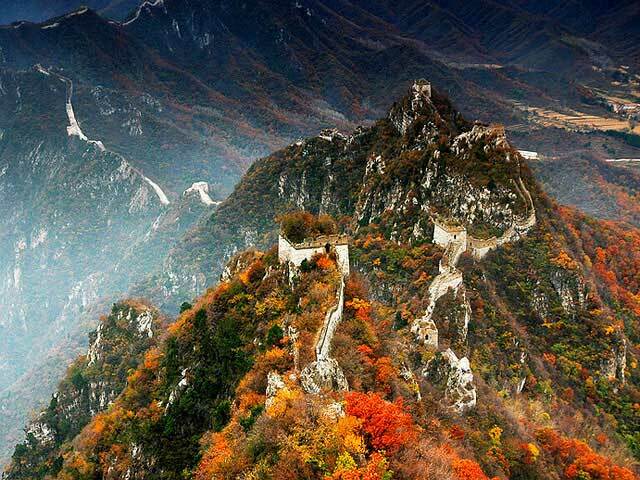 Moreover, Simatai Great Wall retains its primitiveness well. Old bricks and orange walls smell you a sense of ancientry. Especially at dusk, the whole picture before your eyes will make you think of the lost history, the era of full of war flames. And now, with hundreds of years passed by, only breath-taking sceneries left peacefully wait you to appreciate. Wangjing Tower (literally means Looking at Beijing City) is the highest peak of Simatai Great Wall with a height of 986 meters (3235 ft), and it is considered to be the largest tower with special structure. 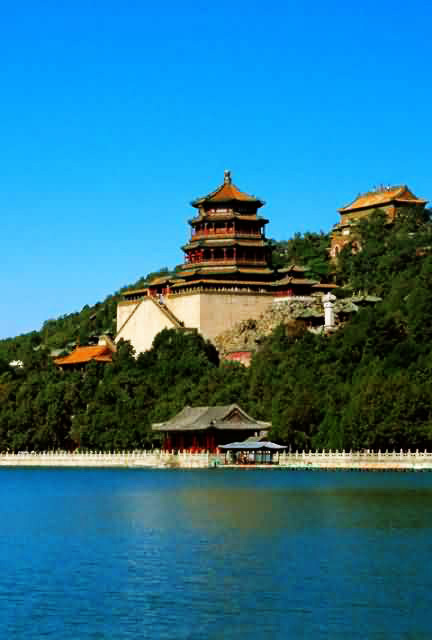 Standing on this tower, one can overlook the whole view of Yan Mountain as well as the beijing city and be enchanted by these amazing sceneries-beautiful trees and grasses, clear sky and lake, old bricks and walls and so on. And Wangjing Tower is the best shooting spot for photo lovers in summer and autumn. 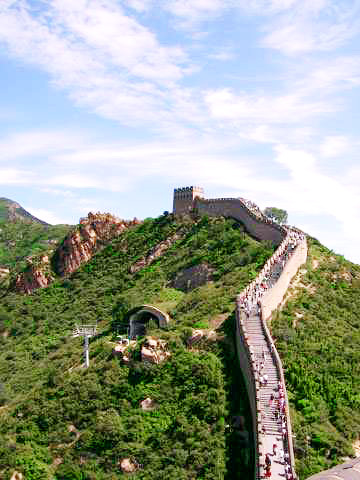 The second highest peak of Simatai Great Wall is Fairy Tower, for getting there, one have to climb a incredible pathway, also named Sky Ladder, which has a span of 100 meters (328 ft) with a gradient of 85 degree's angle! WOW! It is really need one's courage to challenge somewhat of rock climbing alike. The appearance of Fairy Tower is believed to be the most beautiful one among so many towers. And about the name of this tower, there is a romantic story waiting you to discover.